(Bloomberg) -- The world’s largest tobacco companies suffered a legal setback in Quebec this month that drove two local cigarette makers into creditor protection. That may be the tip of the iceberg in Canada for British American Tobacco Plc and others facing separate government lawsuits seeking hundreds of billions of dollars. BAT, Philip Morris International Inc. and a local unit of Japan Tobacco Inc. are defendants in lawsuits by Canada’s 10 provinces that want to recoup health-care costs linked to the effects of smoking, a move reminiscent of the U.S. in the 1990s. The first of these cases, some of which date back almost two decades, is scheduled to come to trial this year. The country’s three most-populated provinces alone have signaled combined claims of more than C$500 billion ($375 billion). While such an amount would overwhelm the industry, analysts are predicting a similar outcome as in the U.S., where tobacco companies negotiated smaller settlements that allowed them to stay in business. Governments generally prefer that consumers smoke and pay taxes on legal cigarettes rather than using contraband products. The legal threat posed by Canada got more real this month, when the three companies’ local units were ordered to pay damages of about C$14 billion in a set of class actions filed by Quebec smokers. That lawsuit, which prompted the Canadian units of BAT and Japan Tobacco to file for protection from creditors, is separate from the provincial claims. In the 1980s, Daynard co-founded the Tobacco Products Liability Project at Northeastern, which helped provide resources to support lawsuits against cigarette makers. The provinces argue that tobacco companies should compensate governments for smoking-related health costs. The firms say Canadian residents were fully aware of the risks since the 1950s. The creditor protection gives BAT’s Canadian unit “an opportunity to settle all of its outstanding tobacco litigation” while continuing to run its business, a spokesman said. Consumers in Canada were well informed of the risks and tobacco is a legal product, according to JTI-Macdonald, Japan Tobacco’s Canadian unit. While the Tokyo-based company isn’t named as a defendant in the provincial cases, it has assumed obligations that could force it to pay penalties for R.J. Reynolds assets it had acquired. A spokesman for Philip Morris declined to comment. The legal challenges have so far had little impact on shares. 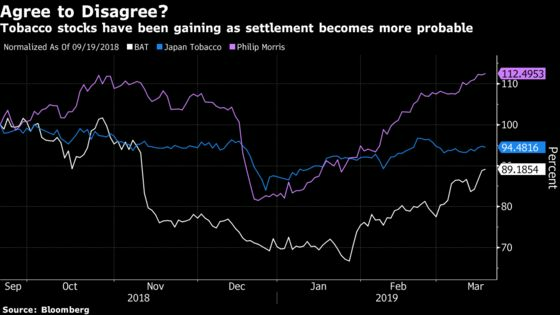 Since the Quebec ruling on March 1, BAT’s stock has gained 12 percent and Philip Morris 3.4 percent, while Japan Tobacco is down 0.9 percent. The share impact has been muted because the cases are likely to drag on for some time, according to Duncan Fox, an analyst at Bloomberg Intelligence. Moody’s Investors Service cited the legal issues in Canada on Tuesday when it put Japan Tobacco’s Aa3 debt ratings under review for a downgrade. In contrast to the Quebec class actions, the provincial cases pose a bigger threat by naming parent companies as co-defendants, Citigroup analysts wrote in a March 4 note. Canada generates no more than 4.5 percent of earnings for any of the three tobacco companies, they said. British Columbia filed its case 18 years ago. That case and the other suits have been grinding through the judicial system ever since. The first trial is scheduled to start in November in New Brunswick. The province of 747,000 people declined to comment on how much it’s seeking, though in its latest annual report, BAT cites estimates of C$11.1 billion to C$23.2 billion. Ontario wants to amend its claim to C$330 billion from an initial $50 billion. Quebec is going after C$61 billion. British Columbia is finalizing its own number, though a preliminary report quantified damages at C$118 billion. Big Tobacco hasn’t faced a legal threat this severe since the U.S. in the 1990s, when Philip Morris USA and its rivals entered a settlement that forced them to make annual payments to 46 states in perpetuity, including some $206 billion over the first 25 years. Analysts expect a similar negotiation in Canada after two potential delays cropped up that could undermine the start of the New Brunswick case. The tobacco companies won a temporary stay in Canadian litigation when the local units of Japan Tobacco and BAT sought protection under the Companies’ Creditors Arrangement Act, which is equivalent to Chapter 11 in the U.S. Also, in the New Brunswick case, a judge ruled that the provincial government needs to come up with records to justify the health-care costs it’s claiming. Analysts say a settlement could allow a speedier alternative. Canada “will now look to gather up the cases together and come to one combined settlement that is affordable and that would not see the tobacco companies go bankrupt,” Jefferies analyst Owen Bennett said in a research note last week.